Key West is just a short and picturesque drive from Miami, Florida down US-1. The islands offer a tropical blend of blue waters, beaches, dining, excursions and shopping. The laid back lifestyle, southern charm and Caribbean flavor are what make Key West the perfect domestic Grad Trip getaway. 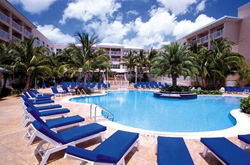 The Double Tree by Hilton Grand Key Resort is a tropical style resort offering 216 guestrooms. Complimentary breakfast and free daily shuttles to and from the beaches and Duval Street. This resort boasts a large outdoor pool with waterfall, zero barrier entry, spa tub, poolside tiki bar, large sunbathing decks and complementary wireless internet. Want to choose your roommates?